Description: When sixteen-year-old Violet agrees to spend the summer with her father, an up-and-coming artist in Seattle, she has no idea what she's walking into. Her father's newest clients, the Yamada family, are the victims of a high-profile art robbery: van Gogh sketches have been stolen from their home, and, until they can produce the corresponding painting, everyone's lives are in danger--including Violet's and her father's. 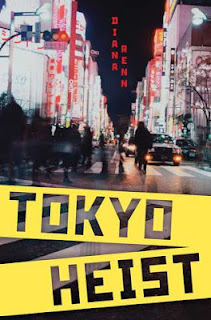 Violet's search for the missing van Gogh takes her from the Seattle Art Museum, to the yakuza-infested streets of Tokyo, to a secluded inn in Kyoto. As the mystery thickens, Violet's not sure whom she can trust. But she knows one thing: she has to solve the mystery--before it's too late. Mini Review: A delightfully fun mystery read that is perfect for the YA lover who either is sick or or dislikes any paranormal/dystopian type of read. Violet is is a charming heroine that many young girls will feel a connection to. This is also a book that the manga lover will thoroughly enjoy as the Japanese animation is an integral to the plot of the story. I did find the constant manga mentions and Japanese expressions a little irritating at times but than again I am not the intended audience for this, so feel free to ignore my comment on that. I also really disliked Violet's father (although there was some wonderful realistic character development with him) and just wanted to smack him on many occasion. Was impressed with the thorough amount of research the author did in relation to all facets of the art world and Japanese culture. I wish the store I worked at had some copies of this book as many of our young customers are sick of the dystopian & paranormal stories and want something just like this. Yup get on it missy. It really was just nice to read something like this after all the paranormal stuff lately. Hope you enjoy!